I am going to share a recipe with you today that screams picnic season, however, I will be using an ingredient that may make you think Fall, which is pumpkin! Yup pumpkin! You know I’m a food blogger and I like to break the rules when it comes to cooking and baking, so today I have the perfect recipe that screams summer and pumpkin, which is my Chipolte Bacon Pumpkin Deviled Eggs. Oh my gosh, you have no idea how amazing these deviled eggs are!! Yummers!! 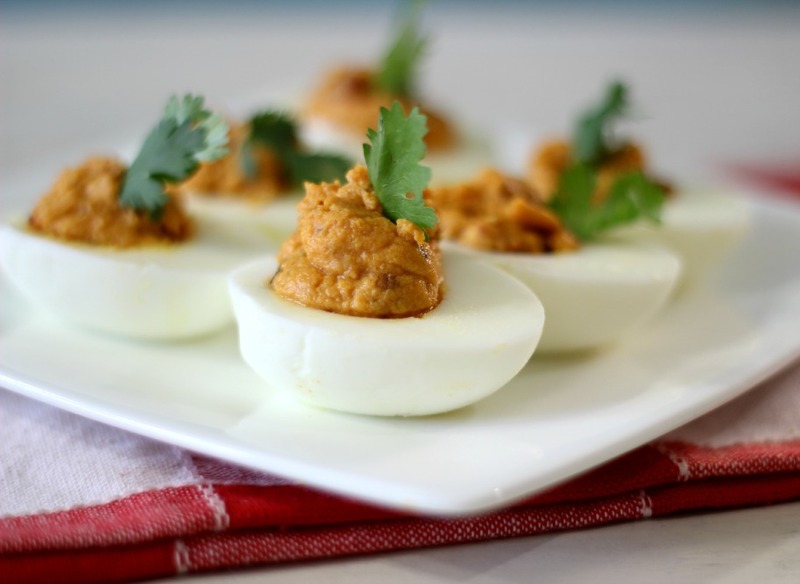 Let me tell you this is one deviled egg recipe that will blow your mind! 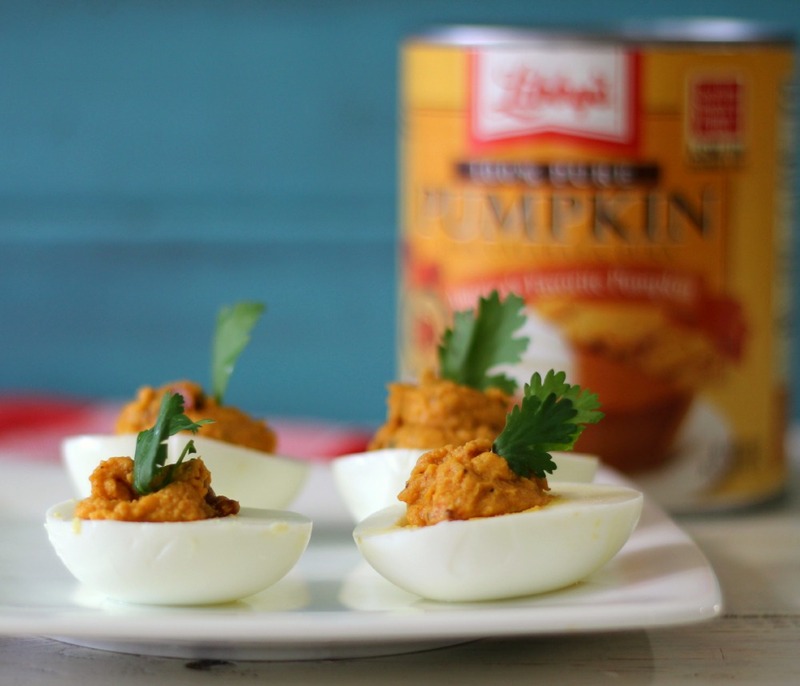 It’s made with Libby’s Pumpkin, chipotle peppers, bacon and of course eggs! It has the perfect amount of heat without burning your mouth. It’s got a nice savory chew from the bacon and it’s all mixed together with Libby’s Canned Pumpkin. It makes for the perfect spring time dish and it’s healthy too because I didn’t use mayonnaise. I like to use pumpkin all year round and I always keep a can of it in stock! It’s a great substitute for mayonnaise and other dishes that you want to reduce the fat. I love pumpkin because it’s full of fiber, vitamin A, all natural and it tastes darn good! I go through a pumpkin stage about every few months and I just love it! So next time your thinking pumpkin is Fall, think again, it’s great anytime of the year!! 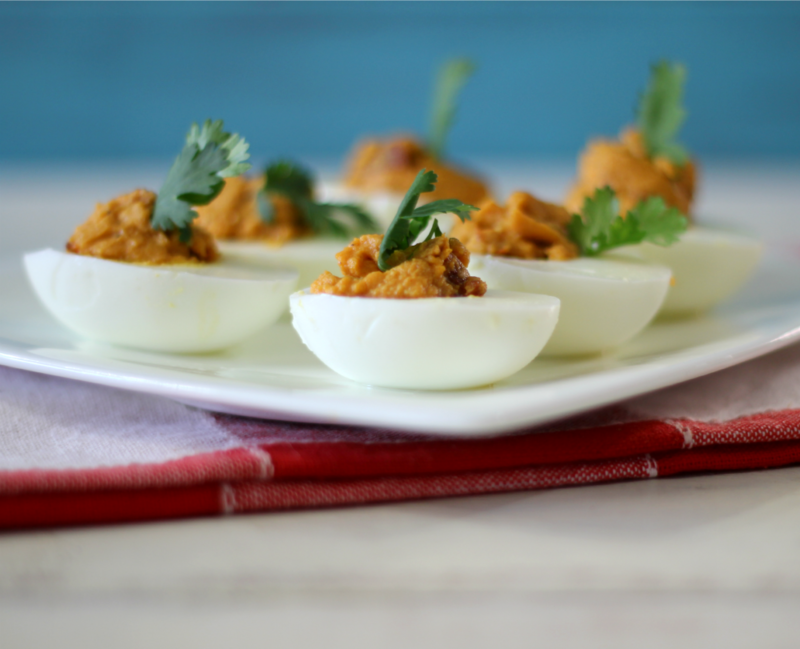 A twist to the traditional to deviled eggs with a hint of heat and is savory from the bacon. Add eggs to a pot and just cover eggs with cold water. Bring to a boil, and cover and simmer on the lowest heat setting for 15 minutes. Run cold water over the eggs to stop the cooking. Let the eggs sit for about 15 minutes until cooled. Peel eggs and slice in half, horizontally. Take two egg yolks and discard the rest and place in a bowl with pumpkin, chipotle pepper, chipotle in adobo sauce, dijon mustard, lime juice, smoked paprika, bacon, salt and pepper. Mix until thoroughly combined. Evenly fill each egg with pumpkin mixture and top with a sprig of cilantro. Refrigerate until ready to serve. So, did I change your mind about pumpkin in the spring and summer? 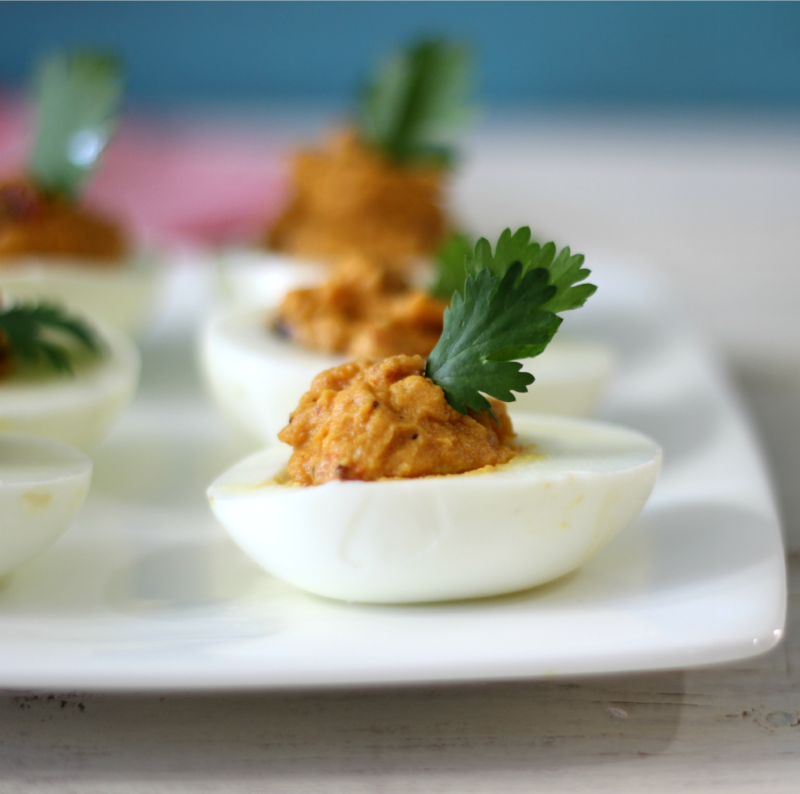 You should really give these deviled eggs a try! They are amazing and guaranteed a hit at your next summer time party! You can check out more spring time pumpkin recipes at Pumpkin Can. 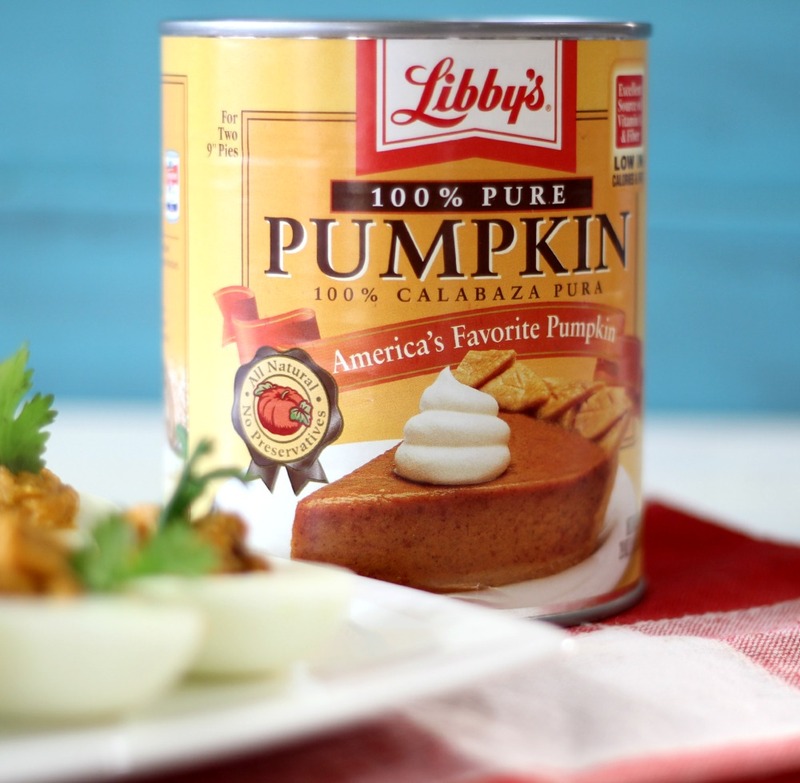 If you can’t find pumpkin, you can go to Libby’s Pumpkin, they will fill you in on where you can get Libby’s Canned Pumpkin. I hope everyone has a great day and a wonderful weekend! !